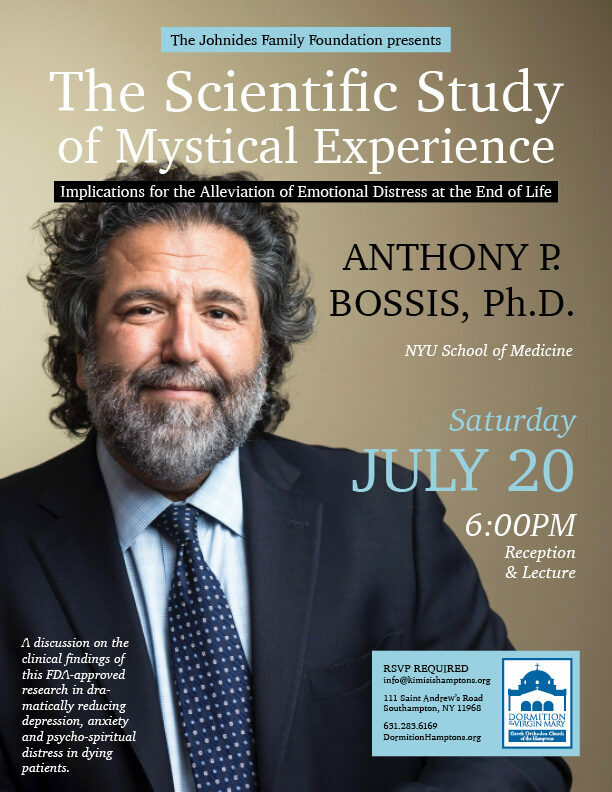 Anthony P. Bossis, PhD of NYU School of Medicine will join us for a reception and lecture on "The Scientific Study of Mystical Experience: Implications for the Alleviation of Emotional Distress at the End of Life". The discussion will be about the clinical findings of this FDA-approved research in dramatically reducing depression, anxiety and psycho-spiritual distress in dying patients. Anthony P. Bossis, Ph.D. is a leading scientist in the reemerging field of mystical experience research. He was director of palliative care on an FDA-approved clinical trial investigating the efficacy of a single psilocybin-generated mystical experience upon existential, psychological, and spiritual distress in persons with cancer or at the end of life. Features of a mystical experience, which have occurred naturally throughout human history, include unity, sacredness, transcendence, ineffability, and an enhanced awareness of positive emotions including that of love. Psilocybin is a natural compound found in specific species of mushrooms. The 2016 landmark findings of a rapid reduction in depression, anxiety, and hopelessness along with helping individuals with cancer cultivate enhanced emotional well-being and foster a greater acceptance of the dying process with less anxiety will be presented. Other implications for the scientific study of mystical experience include the treatment of mental health disorders including addiction and to deepen our understanding of the study of meaning and spirituality. Dr. Bossis is a clinical assistant professor of psychiatry at NYU School of Medicine and supervisor of psychotherapy at NYU-Bellevue Hospital Center and the co-founder and former co-director of the Bellevue Hospital Palliative Care Service. He is also leading an F.D.A. approved clinical trial evaluating mystical experience in religious leaders to enlist their insight in better understanding the phenomenology of mystical or religious experience. Dr. Bossis maintains a private psychotherapy practice in NYC.